The following workshop is organized by Pace e Bene friends Reedley Peace Center in Fresno, CA. The trainer, Sarah Thompson, was a former Pace e Bene intern in Oakland, CA. 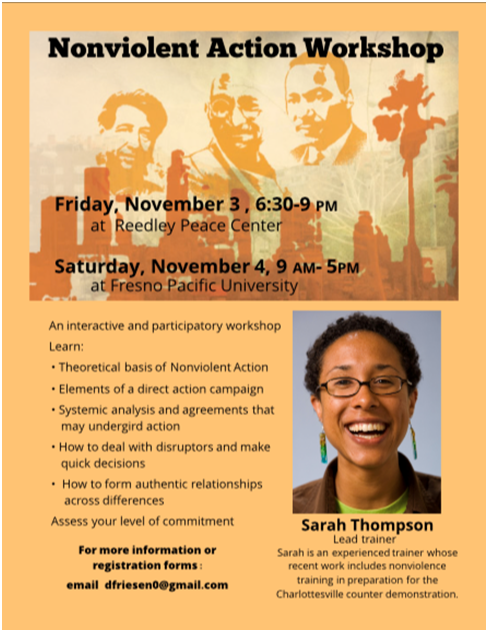 We invite you to participate in a Nonviolent Action Workshop on Friday evening, November 3 (at Reedley Peace Center) and Saturday, November 4 (at North Hall on the campus of Fresno Pacific University). The lead trainer for this workshop will be Sarah Thompson. Sarah is from the Great Lakes watershed, currently living in Chicago. She is a 2006 graduate of Spelman College and received her MDiv in 2011 from Anabaptist Mennonite Biblical Seminary. Over the last five years she has trained people of faith and moral courage in nonviolent direct action preparation. Most recently she was the Executive Director of Christian Peacemaker Teams. She is now transitioning to the Martin Luther King Jr. Center for Nonviolent Social Change. This training is co-sponsored by Reedley Peace Center, Center for Peacemaking and Conflict Studies at Fresno Pacific University, and Central Valley Partnership. The fee for the training is $20 for adults and $5 for students. A noon meal will be provided at the Saturday event.